Alice Cooper confirms that Joe Perry’s onstage collapse during a July 10 concert in Coney Island by supergroup The Hollywood Vampires was due to a combination of dehydration and exhaustion. "Aerosmith does two shows a week, but we were on our eighth show in nine days, and I'm used to working like that," Cooper tells Rolling Stone. "I'm used to working an hour and 40 minutes or two hours, five nights a week. I was in shape and so was Johnny [Depp] and everybody else. I think Joe was not ready for that kind of pace." "We were doing 25 to 30 songs with no break," he continues. "You're in fourth gear, and there's no 24-hour resting period. I think it just caught up with him. He finally got up there onstage, dehydrated. And I think he was exhausted. He told me the night before he hadn't eaten in two days." "I said, 'Man, you've got to know when to sleep. You've got to know when to eat on a tour.' I think it just finally got to him. It was not a heart attack; it was pure exhaustion. They checked his heart and said his heart was actually very strong." Cooper recalls his reaction to seeing his bandmate collapse during the second song of the concert. "It scared the hell out of me," he says. "The lyrics to ['Raise the Dead'], the first song we played that night, go, 'Cardiac, heart attack … they never feared the reaper,' and I look around the stage and he's gone. He was lying behind an amp on his back, and I went, 'Oh, my God.' We didn't know what happened until after the show." 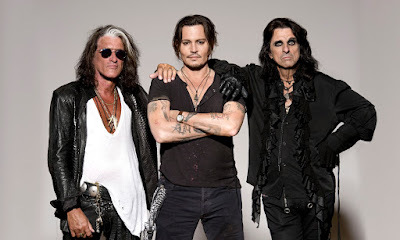 Perry was hospitalized after the incident and rejoined The Hollywood Vampires just twelve days later for a July 22 show at Weill Hall in Rohnert Park, CA. and the final three dates of the summer trek. The guitarist will regroup with Aerosmith for a South American tour this fall.